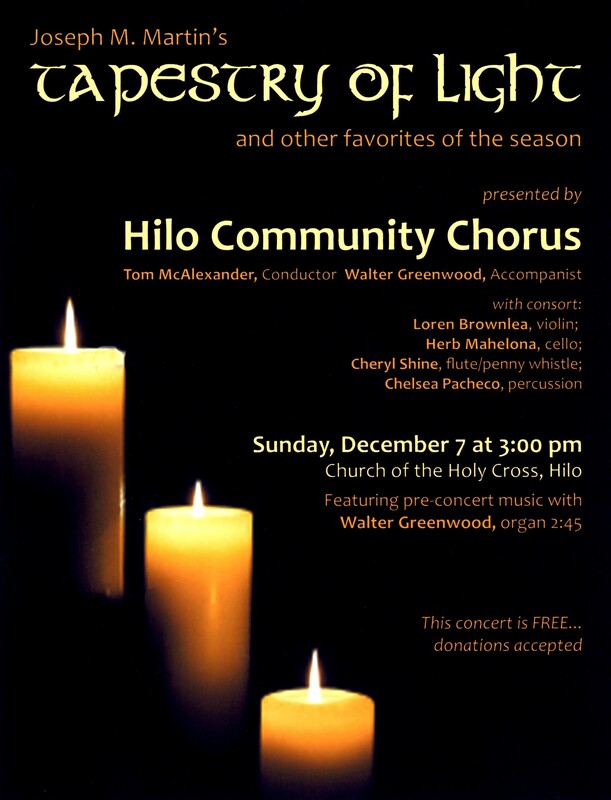 The Hilo Community Chorus, conducted by Tom McAlexander and accompanied by Walter Greenwood, will present its annual holiday concert on Sunday, December 7 at 3:00 PM at the Church of the Holy Cross in Hilo. However, you will want to arrive early–by 2:45– to hear pre-concert music played by Greenwood on the fabulous Holy Cross organ. In the second half of the program the Chorus will present Joseph M. Martin’s “Tapestry of Light: A Celtic Christmas Celebration.” They will be accompanied by a Celtic consort of Greenwood on piano, Loren Brownlea on violin, Herb Mahelona on cello, Cheryl Shine on flute and penny whistle, and Chelsea Pacheco on percussion. As in the first half, solos will be sung by Chorus members. In “Tapestry,” Martin, who will be in Hilo next October, has taken very familiar Celtic tunes and added new words to tell the Christmas story. Members of the Christ Lutheran Church Chancel Choir will join with the Chorus in this presentation. This concert is free. It is presented as a gift to the community. Please join us for our annual Christmas concert this Sunday December 8 2013 at the Church of the Holy Cross, 440 W Lanikaula St, Hilo, HI 96720. Pre-concert music starts at 2:45. The chorus begins singing at 3:00. THE CONCERT IS FREE, and there will be calabashes available for a free-will offering. For more information about the concert, please read the post below.